Preliminary geotechnical investigations will start during the week of 15 April 2019. This will involve drilling bore holes on either side of Barr Creek, and also over the water, to determine soil conditions. Vegetation may need to be removed to allow access to these sites. Data from these geotechnical investigations is required for the detailed design of the bridge. A Development Application is also required and this is expected to be lodged in May 2019. The proposed location of the bridge over Barr Creek has been based on assessment of many factors including community feedback, constructability and environmental protection. Following these assessments, the location for the bridge has been moved west towards the Willow Street Reserve, further away from residential houses. The path will then weave through the Air Services land in Machans Beach, connecting to Arnold Street. For further information about these alignment changes, please review the revised alignment plans below. 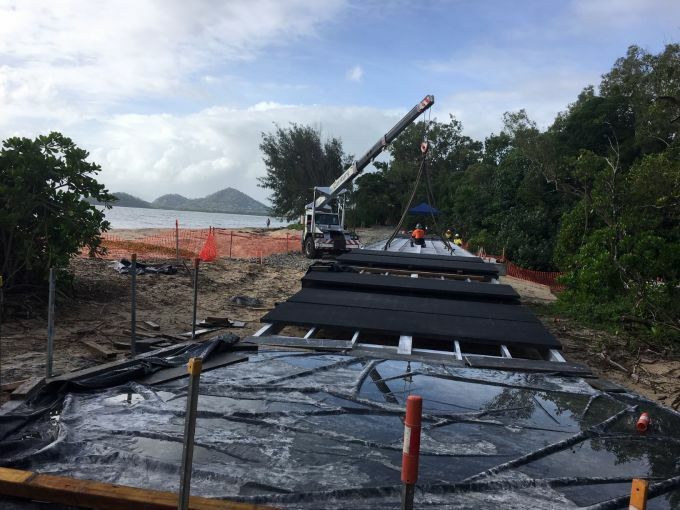 Concrete path works are expected to start along the foreshore of Upolo Esplanade in May 2019. Photographs of works underway at Delaney's Creek are shown below. 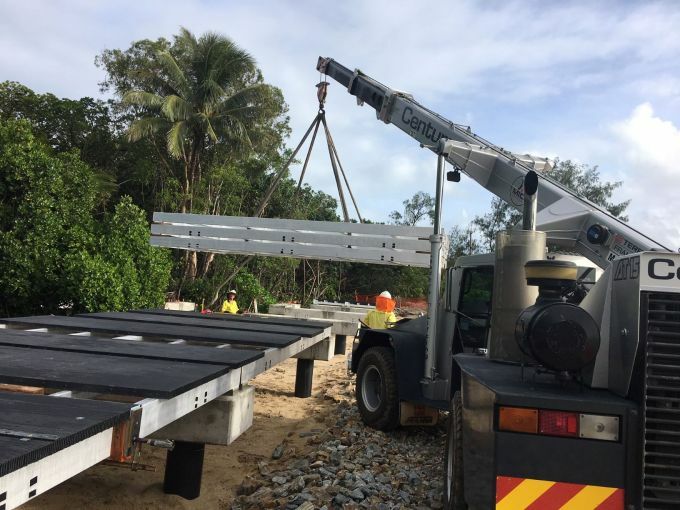 The Northern Beaches Leisure Trail is being designed and constructed in a staged approach to deliver on Council’s vision to connect Palm Cove to Cairns city. Once complete, the shared path will provide a continuous walking and cycling link for locals and visitors alike. It will offer enhanced recreation and fitness amenities for the entire community including young families using prams, people in wheelchairs, seniors with mobility devices and people on bikes. The trail will provide a unique recreation and tourism experience that showcases the region’s beautiful beaches and island views, as well as providing an important active transport alternative to the car. 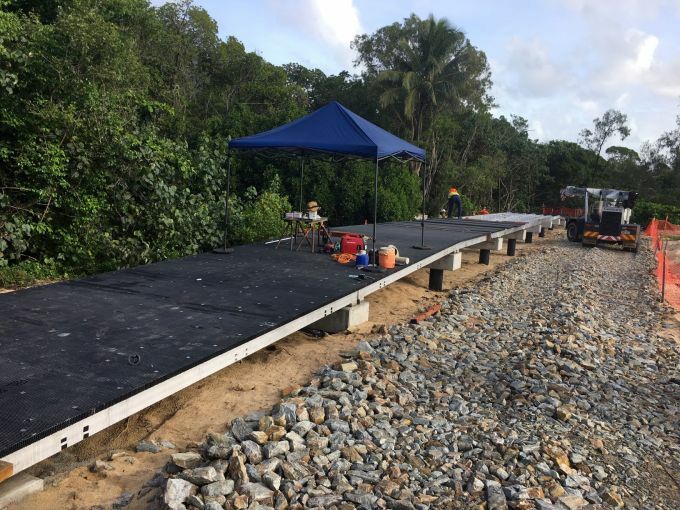 Three foreshore pathways have been constructed at Palm Cove, Clifton Beach South and Kewarra Beach. An additional foreshore pathway is underway in Clifton Beach north. The foreshore pathways are considered to be the focal point of the trail and provide improved access and enhanced recreational opportunities for the community. The preferred alignment to connect the foreshore pathways on this section of the trail is being explored. An indicative route is available on Council's proposed walk and cycle network maps and the Department of Transport and Main Roads website on the principal cycle network plans page. This section of the trail will be a combination of on and off-road pathway with a connection to Syd and Jayne Granville Park. The proposed pathway and bridge connection alignment has been designed to showcase the region’s beautiful beaches and views. Works are anticipated to be completed by March 2020. Community consultation regarding a concept path alignment and bridge location was undertaken late 2018. Read the Holloways Beach to Machans Beach fact sheet ( PDF, 0.92 MB ). The leisure trail is an element of the Holloways Beach foreshore improvement works that are expected to be complete by June 2019. Head to the Holloways Beach foreshore improvement page for more information about the project. The Northern Beaches Leisure Trail is a priority of the Cairns Cycling & Walking Strategy 2010–2030 and is joint-funded by Cairns Regional Council, the Australian Government’s Regional Jobs and Investment Packages program, and the Queensland Government’s Cycle Network Local Government Grants program.